That’s what Caleb called it today…don’t mess with his recess! I found twenty minutes between showers of the liquid and frozen variety to give a few plants a new home and found that my lily of the valley patch had sprung to life…spring is like that. However there is a story that makes this occurence all the more sweet! When the calendar flips over to May, we will have lived in our home for 17 years…it is hard to believe. There were not a lot to our flower beds when we took residence…the previous owner took what was dear to her but we didn’t mind because it was all about starting fresh. 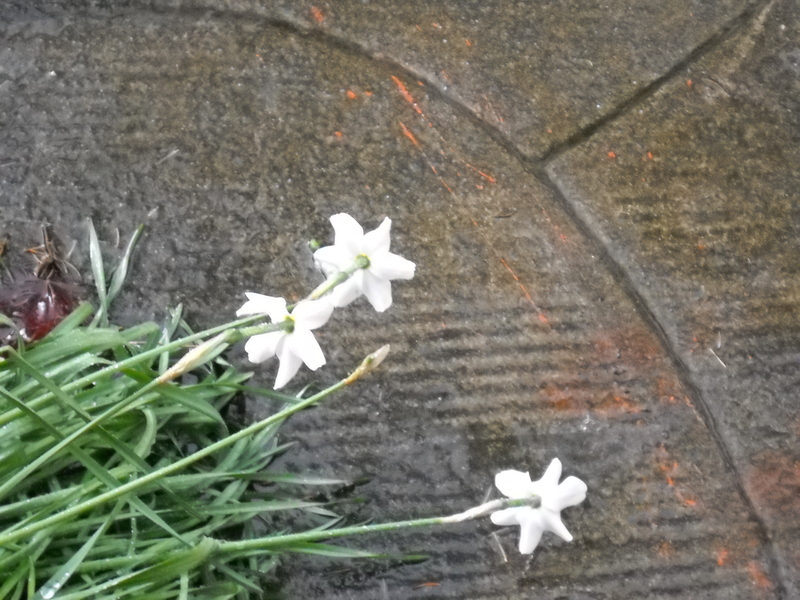 We were not experienced gardener…still aren’t but we did the best we could. It was late May when we moved in and just a month shy of Courtney’s arrival. The following spring I discovered, much to my delight, lily of the valley growing…a huge bed full of the wonderful fragrance of spring. Imagine my surprise one Saturday when Carl told me he did some back yard weeding which to my dismay included the lily of the valley. A few plants were spared and I replanted them on the side of the house…away from overenthusiastic hands…they have grown well but it has taken time…some years have been stellar…I had the tradition of bringing a bunch to the kids’ teachers for May Day…some years I have missed that small window of joy…I would forget to look out for them and then an unseasonal heat spell and they would be spent. Today I found masses of them…they have spread out and are hiding beneath bleeding hearts and the irises that have shot up as well…there are plenty for inside…plenty for Caleb’s teacher tomorrow (as close as I can get to May 1st) and plenty for my neighbors to see and overlook some still present weeds. There is something about spring and all the wetness and freshness…all the color and scents…all the promise of sunnier days to come. I love looking at empty spaces of dirt that can be transformed by seeds and plants. I love that the showers seem to be washing down sidewalks and foliage and lives…as if trying to wash away the residue of a long winter yet storing needed nourishment for dryness around the corner. 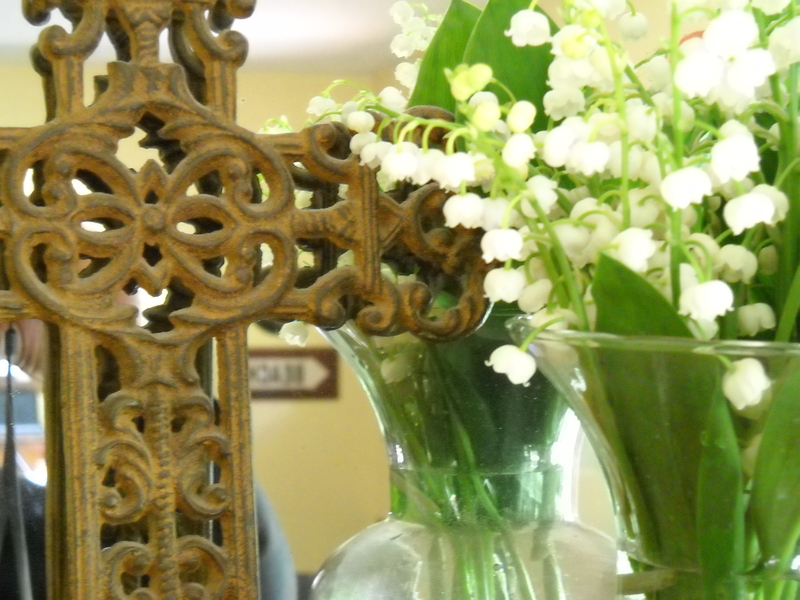 So my mantel today reminds me in blooms of the altar which is my heart…an altar to a Savior that has made all things new and given me new life…fresh, fragrant and alive. May I never forget to look for Him and miss His glory. lily of the valley remind me of my dad. His birthday is in may and this is the flower associated with may birthdays. 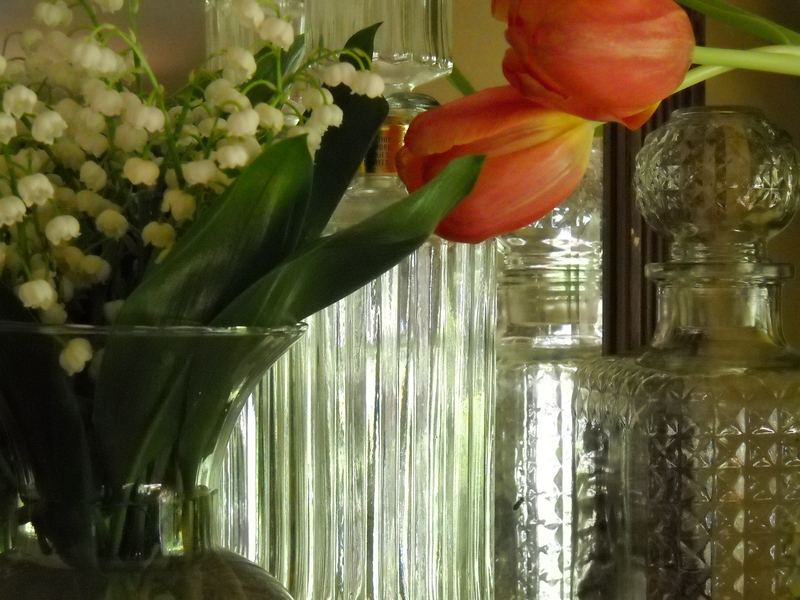 In the house where i used to live a small bunch would bloom every may and i would think of my dad and his mom june whom i am sure planted in my brain that lily of the valley is my dad’s flower. Isn’t that a name i have heard used for our Christ as well? Ahhh Kim, that blesses me by what you shared…what a special memory…you have me singing one of the songs I remember from church camp…You are the lily of the valley…you are the bright and morning star…you are the door by which we must come…you are the Light of the World…for God so loved the world that He gave His only Son…that whoever believed in Him…would to His kingdom come…you are the lily of the valley…..
Beautiful! I need to plant some of that!!! wooohooo! May Day! I planted some violas after seeing your sweet ones last week!